Posted February 1, 2019 by Sarah Lederle & filed under . Just when you think the race has been decided – bam! The Pedigree Stage Stop Race saw several shake-ups today in Driggs, ID, and the dust (or snow!) has not yet settled. The excitement is not slowing down. Some of the last mushers to leave the starting chute missed the trail this morning as it twisted and turned through a series of driveways not more than a couple miles from the start. The trail was well marked and the majority of mushers went the right way. It’s unfortunate but it is what it is, and that’s racing. I myself have been in that spot a time or two: Did I just pass a marker? Am I on the right trail? A set of three confidence markers are always set after any junction or crossing to assure you that you are going the right way. So if you haven’t seen any markers, chances are you’re going the wrong way. Now sometimes a driveway can loop you around back to the trail but it’s not a guarantee. Emilie Entrikin won the day with a time of 2:10:02 for the 32-mile stage. Jeff Conn was 7 seconds behind Emilie, with Anny Malo only another 46 seconds back. Alix Crittenden with a time of 2:14:12 and Dave Torgerson with 2:14:48 round out the top five. As you can tell from the day’s times, most mushers had good runs. It is an up-down, up-down kind of trail, very fun to drive a team on. In the overall standings, Anny Malo moves into the top spot followed by Emilie Entrikin, Alix Crittenden, Jeff Conn and Dave Torgerson in the top five. Bruce, Richard, JR, and Lina fill out the top ten overall. Justin Fortier had an excellent day as did Fernando Ramirez. 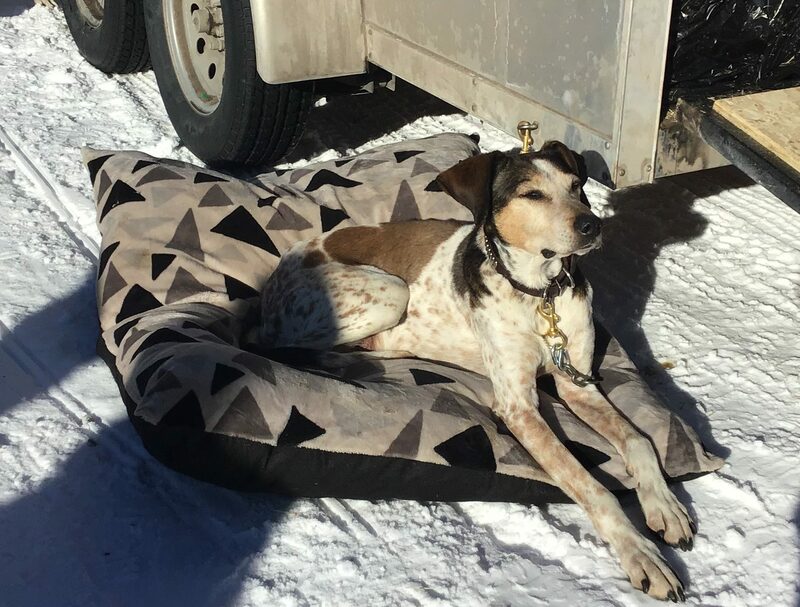 It really warms my heart to see these two first-time Pedigree Stage Stop Race mushers going into the last day strong and with a full squad of healthy, happy dogs. This is where one might see their team really coming together and shining. It’s a beautiful thing to be a part of. The dogs just seem to get stronger every day, both physically and mentally. We still have plenty of racing to be done tomorrow on the last day. As today has shown us, just about anything can happen. The final leg of the race is tomorrow morning, Sat., Feb. 2, in Teton County, WY. Please take a more detailed look at the day’s times along with the overall and especially the split times as they become available. Heidi, a retired sled dog from Streeper Kennels, chills out at the staging area in Driggs.